Google is running an NFC and QR code based digital advertising campaign in airports around Australia, allowing travellers to use a smartphone or tablet to take control of Google Play video ads on giant screens. 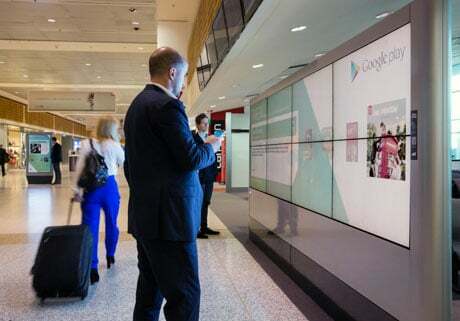 Travellers visiting Sydney, Melbourne and Brisbane airports can interact with Google Play content by tapping an NFC tag or scanning a QR code featured on 39 digital advertising panels managed by out-of-home media company Ooh! Media. Android phone users can also download selected books, movies, music, magazines or apps directly to their phone using Ooh’s free airport WiFi. The system uses Red Crystal, software that creates an interactive session between a smart device and a large screen without the need to download any software. “Back in 2002 when Minority Report featured a scene where billboards talked directly with individual consumers, this was only the stuff of science fiction. “This campaign is a real example of how the traditional billboard and technology can work together to gain a deeper connection between a brand and individual. It demonstrates how well online and digital billboards work together, and how smartphones can drive engagement and enable consumers to connect and transact with the brand online — immediately. “We believe this signals the start of something really remarkable for how companies market to the consumer”.